figlio di un giovane percussionista. Chissà se anche lui crescendo s'innamorerà di tamburi, piatti e batteria. It's a wonderful quilt for a little child. It looks so cute. Una colcha preciosa, un color muy dulce y un osito muy lindo!!!!!! Baby Thomas will love his quilt forever! 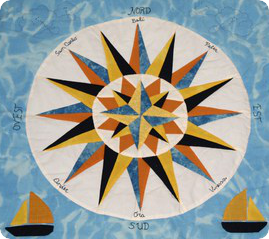 What a cute baby quilt that will be cherished! Wonderful quilt that Thomas will cherish! I love the design - very cute.